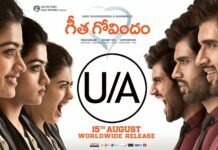 Geetha Govindam is one of the most awaited Telugu movie and the reason for the huge hype is its beautiful promos featuring sparkling chemistry and romance between Vijay Devarakonda and Rashmika Mandanna. The movie is slated to hit the screens on August 15 and the film unit is now busy promoting it on various platforms. Vijay Devarakonda and Rashmika Mandanna lip-lock Video scene in Geetha Govindam has allegedly been leaked on the internet. This kissing footage is now creating a buzz on social media. 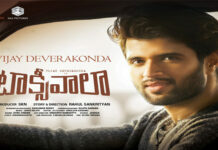 To their shock, Vijay Devarakonda and Rashmika Mandanna Lip-Lock Video from Geetha Govindam has allegedly been released on the internet three days ahead of its release. This is apparently not the original clip and it seems to have been recorded during its screening on a laptop or a TV. The leaked video from Geetha Govindam Movie shows Vijay Devarakonda and Rashmika Mandanna travelling in a bus. While all other passengers are asleep, Rashmika closes the window with a curtain and sits on the laps of Vijay Devarakonda who seems embarrassed by her sensual act. Vijay looks scared of other passengers glaring at them. But Rashmika dares to lock her lips with him. This 26-second-long leaked clip appears to be romantic and has increased the viewers’ curiosity about Vijay Devarakonda and Rashmika Mandanna’s sparkling chemistry in Geetha Govindam.